Purchasing fine jewelry can be an overwhelming task because of the varieties of gemstones and metals you need to consider. There are important factors that you should keep in mind when looking to purchase jewelry to ensure you are getting your money's worth. The tips in this article will help you consider all of the things you should know when looking to purchase fine jewelry. * Purchasing from a trustworthy and reliable vendor is very important. The best way you can do this is by purchasing from a jeweler that has been around for decades. Usually jewelers with years of experience backing them means that they won't sell you cheap imports or less than quality pieces. Make sure you find a jeweler who does offer a warranty on your purchases. If a company isn't willing to back their own pieces, it can be a sign that they are selling inferior jewelry. Don't purchase jewelry from mall kiosks. Kiosks usually come and go, haven't been in business long and offer falsely stamped jewelry with plastic gemstones. * The internet can be a wonderful and terrible place at the same time when it comes to purchasing Credit: http://www.freedigitalphotos.net/images/view_photog.php?photogid=330 jewelry. There are many great deals to be had, but you must know what you're purchasing and who you're purchasing from. Oftentimes, the stock photos you see displayed on websites aren't representative of the actual piece you think you are buying. Read the customer reviews of that particular piece and compare what each person had to say. These reviews can offer honest insight into the real size and quality of a piece. It is also imperative that you check the sizing and dimensions of each product. Hidden somewhere in the description you will usually find the length of the pendant, length of the chain, size of the ring etc. Stock photos are generally enhanced in many ways and usually don't represent the actual item. The jewelry you see in photos is generally enlarged and not the actual size of the piece. Consider the company's return policies and warranties before placing your order. A good return policy is important in case the item you receive isn't what you ordered or doesn't look the way it's been represented on the website. * Bargains can be fun to find, but if the internet and jewelry stores are full of them, be leery. If you like to shop antique malls, thrift stores, garage sales and flea markets, then you may have a better chance of finding a "diamond in the rough," so to speak. However, when you walk around at your local mall and see "real" silver jewelry for $10 or actual diamond rings for $100, you should really be cautious. Many companies sell cheap imported silver or plastic jewelry sprayed with a silver tone or gold finish. Make sure you know exactly what you are buying and stay away from very cheap jewelry, unless you have a trained eye and know you're getting a good deal. * Jewelry made from precious metals is very common. Sterling silver is very popular due to its affordability and its elegant, timeless look. However, there is a lot of sterling silver popping up on the market today that isn't real and made in factories overseas. These types of jewelry may be "unstamped" or falsely stamped as silver. Make sure you carry a magnet with you, as sterling silver never attracts a magnet. Purchasing gold (white or rose) as well as tungsten, stainless steel and platinum can be a hard task. Many cheap kiosks at the mall sell them in fake forms and so, as a discerning shopper, you need to understand their properties. Every precious metal has an important attribute that you need to consider. Real sterling silver will never attract a magnet. Biting down on a gold jewelry piece, for 14K and up, can determine if your piece is real or not. If you leave a bite mark, it's real and, if not, chances are that there is only very little gold or none. * The 4 Cs of diamond buying were developed in the 40s and 50s by the Gemological Institute of Credit: http://www.freedigitalphotos.net/images/view_photog.php?photogid=151 America (GIA) and have been used by diamond connoisseurs ever since. The 4 Cs are carat, color, clarity and cut. Like other gemstones, diamonds are weighed in metric carats. One metric carat is about 0.2 grams to be exact (the weight of an average paperclip). The carat of a diamond determines the price; it can be said the smaller the more affordable and the larger the more expensive. A diamond's worth is determined by the colorlessness. The less color a diamond contains, the more it is worth. An expensive diamond will be clear and colorless; meanwhile less expensive ones will contain a small tint of yellow or brown. The clarity of the diamond is very important. Since a diamond is developed within the earth at extreme temperatures, it will either have an internal inclusion or external blemish. Using the GIA International Diamond Grading System, a diamond is assigned a value based on its clarity. The clearer a diamond, the more expensive it is. Finding a diamond without any inclusions or blemishes is extremely rare and costly. The last C represents the cut of a diamond. A traditional diamond is cut with 58 facets to enhance beauty. However, diamonds can be cut in many ways. A cut of a diamond is determined by three factors: brilliance, fire and scintillation. The brilliance is the amount of total light reflected from a diamond, the fire is the dispersion of light that falls into the total colors of the spectrum and the scintillation is the sparkle that a diamond provides when moved in different angles. All of these are imperative when purchasing the perfect diamond. It is important to get your money's worth! 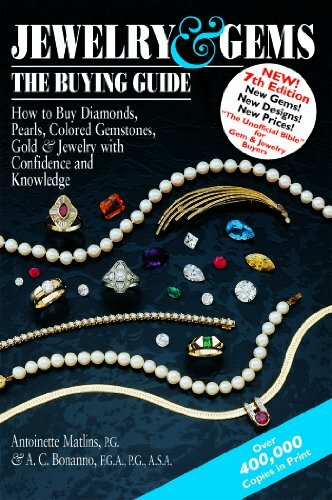 Consider taking all of this knowledge with you on your next jewelry shopping trip. You will find that your overall knowledge on jewelry has greatly improved and you will get the best results for your money. This way, you are sure to avoid any embarrassment by purchasing a valuable piece.